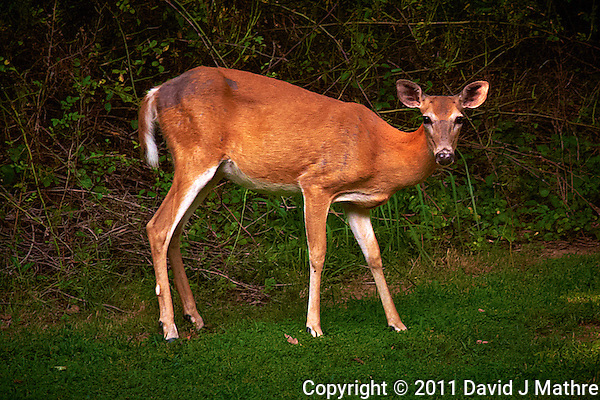 This is the doe that was on the other side of my car last evening when I was taking the pictures of the fawn. I actually took this image while still sitting in the car with the Leica D-Lux 5 point & shoot after lowering the window. The quality is OK for recording the moment, but is not the same as the images of the fawn taken with Nikon D700 DSLR camera. The tomato plants on my deck were looking much better after being watered last night and the light rain this evening. The big plants now have flowers, but have not set yet. The grape or cherry plants have many green tomatoes that have set. I didn’t get images today to show the progress of the plants because it was raining, but will try tomorrow. Wary Doe Looking at Me. Summer Backyard Nature in New Jersey. Image taken with a Leica D-Lux 5 camera (ISO 200, 19.2 mm, f/3.3, 1/125 sec). Raw image processed with Capture One Pro 6 and Photoshop CS5.